How Many Calories in a Peanut Butter & Jam Sandwich? The exact number of calories in your peanut butter and jam sandwich probably varies from day to day. Unless you're measuring the exact amount of peanut butter and jam before spreading them onto the bread, there is no way to know exactly how many calories you're eating. The calories also vary depending on the type of bread, peanut butter and jam you select for your sandwich. A sandwich made with 2 slices of whole-wheat bread, 2 tablespoons of peanut butter and 1 tablespoon of jam comes to about 385 calories. The type of bread you use affects the calories in your sandwich. Most store-bought, whole-wheat bread has about 70 calories per slice, meaning that it contributes 140 calories to the sandwich. A slice of homemade whole-wheat bread has about 120 calories per slice, contributing 240 calories to your sandwich. White bread contributes about 70 calories per slice, as well. Some hearty breads with seeds and nuts may be higher in calories than just plain wheat or white bread. So, depending on your selection, bread contributes anywhere from 140 to 240 calories to your sandwich. The type and amount of peanut butter you use also affect the calories in your sandwich. Two tablespoons of regular smooth or creamy peanut butter has roughly 190 calories. Some reduced-fat peanut butter spreads have slightly fewer calories per serving. If you don't measure the amount of peanut butter before smearing it on the bread then you won't know exactly how many calories it contributes to the sandwich. You can try to estimate the serving size using the comparison that a golf ball is roughly 2 tablespoons. 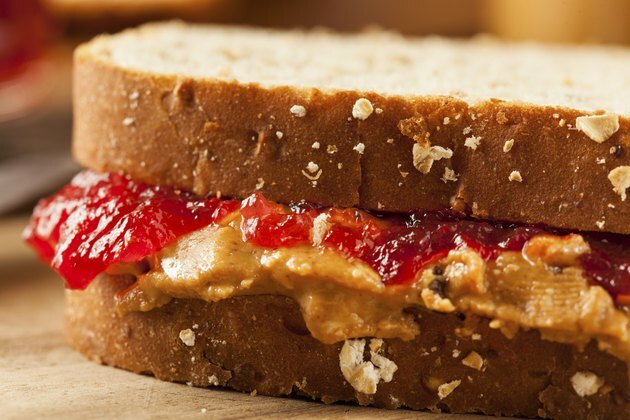 Your jam or jelly selection influences the calories in a peanut butter-and-jam sandwich, as well. A tablespoon of most jam and jelly provides about 55 calories. It can be any flavor, such as grape, strawberry or any other berry. Selecting sugar-free or low-sugar varieties usually decreases the calories per serving. As with peanut butter, you have to measure the serving to truly know how many calories you're ingesting. In addition to calorie fluctuations, the nutritional value of your sandwich varies, depending upon your ingredient selection. Choosing whole-grain bread, such as whole wheat, instead of white bread that's made from highly processed flours, increases the nutrients in your sandwich. Whole-grain foods provide more B vitamins and fiber than refined grains. Choose all-natural peanut butter and jam instead of additive-laden alternatives. Many mainstream peanut butters and jam contain artificial ingredients, such as corn syrup, food coloring and hydrogenated oils. The Center for Science in the Public Interest notes that eating these ingredients in large amounts may be unsafe and may lead to poor nutrition. How Many Calories Do Sub Sandwiches Have?